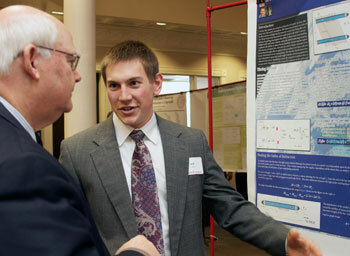 Wabash’s Celebration of Student Research, Scholarship, and Creative Work celebrates the hard work, and unique curiosity of its students. Students have come together for 12 years on the last Friday in January to present an afternoon of poster talks and short lectures. Celebration Friday is the only day of the year classes are canceled in the afternoon so all students can attend. Visitors might expect to see talks and presentations on the likes of Nietzsche and Schweitzer. But this year, like in many of the prior events, students will take an academic look at figures like the Coen Brothers and Godfather character Michael Coreleone. The January 27 Celebration begins at 1 p.m. throughout Detchon Center. Throughout the afternoon students make oral presentations, posters talks, and exhibits. Here is a complete rundown of the 2012 Celebration presentations. “The Celebration demonstrates the emphasis we place on fostering student engagement and passion for research, scholarship, and creative work,” said Chemistry Professor Lon Porter, this year’s Celebration Chairman. Visitors include students, faculty, staff, and members of the Wabash College Board of Trustees and Board of Directors of the National Association of Wabash Men. Porter said the Celebration is one afternoon’s example of Wabash at its best.